Forksville, located along the Loyalsock Creek in Sullivan County, was established as a borough in 1880 and, in the 1900 census, had 152 residents. Today there are around 50 residents. Forksville is also the site of one of the three remaining covered bridges in Sullivan County – all still in use to traffic. Built in 1850 by Sadler Rogers, this Burr Truss design has withstood the test of time. 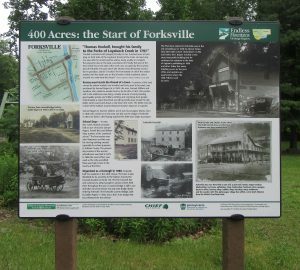 An interpretive panel celebrating Forksville’s unique history willl be dedicated at 10 am on Thursday, July 12 along Rt. 87 at its junction with Rt. 154. 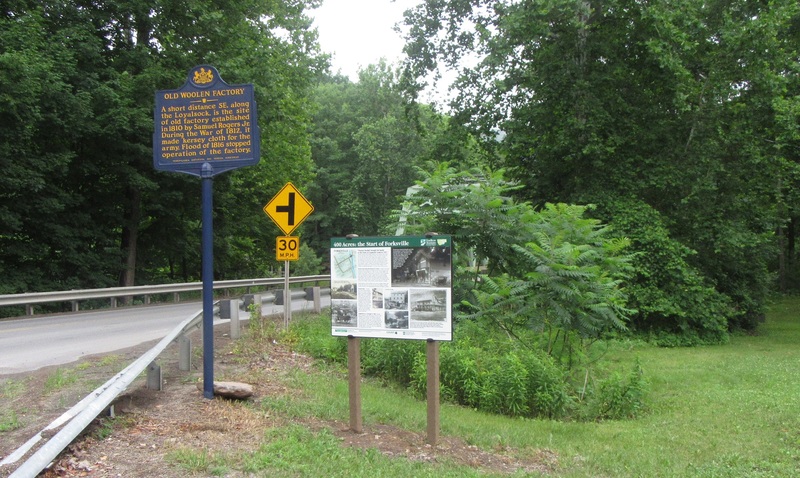 To commemorate the history of the town of Forksville, the Sullivan County Historical Society, Chief Gas & Oil, DCNR and Endless Mountains Heritage Region have placed a historical sign at the juncture of Route 154 and Route 87. It is located on the property of Randy and Peg Bagley’s convenience store. The installation of the sign was done by the Sullivan County Rural Electric Cooperative by Tom Livsey and Derrick Higley, with Penn Lines writer John Zelewiz looking on and taking photos. The research of historic facts, searching through the museum’s photos to choose which to incorporate, and the final proofing of the sign was done with the invaluable help of local historian Grace (Wilcox) Cott. Grace was born and raised on Norton’s Ridge in Forks Township and moved to Forksville in 1955 when she and husband Carl were married. Grace has raised her family in the same home on Bridge Street that she’s been in ever since then. The initial settlement of the area begins with Thomas and Sarah Huckell in 1797. After being widowed, Sarah sold 140 acres to Samuel Rogers Sr. in 1802. Samuel and his sons began a Kersey wool factory along the Loyalsock Creek, which did a goodly business for the uniforms used in the War of 1812. Samuel’s youngest son, Moses (born in 1806), laid out the town of Forksville in 1854 and watched the town prosper until his death in 1879. Forksville was given a half acre of ground to build the first school house in Sullivan County in 1816 by Sarah Huckle. The second school building, though now abandoned, was erected in 1875 and still stands today. And at one time it was the only accredited high school in the county. Many settlements and towns like Forksville had self-sustaining individualized craftsmen. All things were done by hand, unless helped by horse, oxen or waterways. 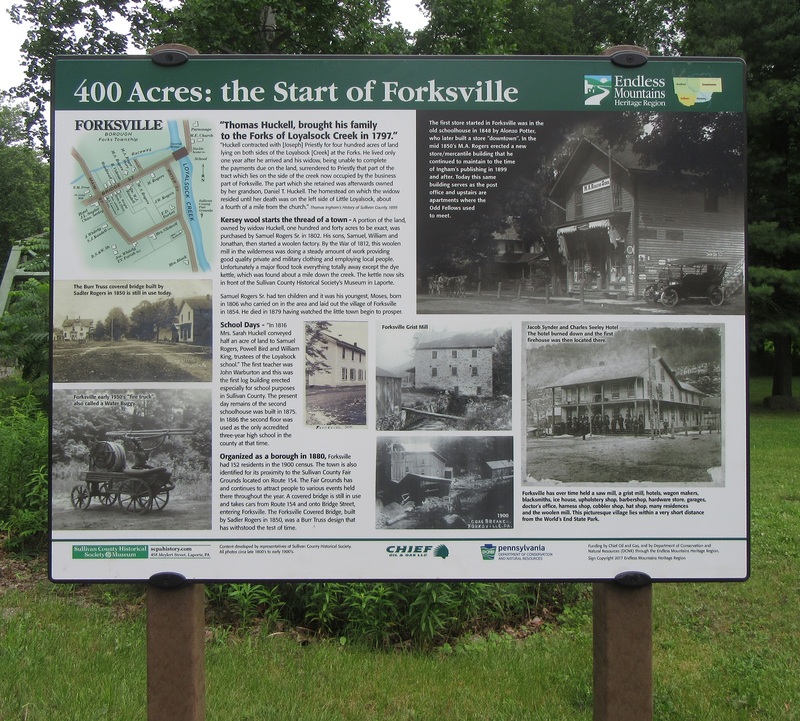 Life was vastly different than our lives today and much of that you’ll discover when you see the sign with photos during the inception of this quaint little town called Forksville.